Newington, NH (May 9, 2017) – SIG SAUER, Inc. is pleased to announce the expansion of its 9mm full metal jacket (FMJ) Elite Performance Ammunition offerings with the addition of 124gr and 147gr bullet weights. With these new rounds, SIG customers now have three 9mm bullet weights – 115gr, 124gr and 147gr – available in both the V-Crown® jacketed hollow point (JHP) personal defense ammunition and the SIG FMJ target loads. The perfect combination of affordability and performance, the SIG FMJ ball ammunition is designed to approximate the performance of the corresponding JHP loads, making a seamless transition from target ammo to carry ammo. The copper-coated lead bullets in the SIG FMJ ammunition were engineered to have the most precise, uniform profile, resulting in consistent accuracy. 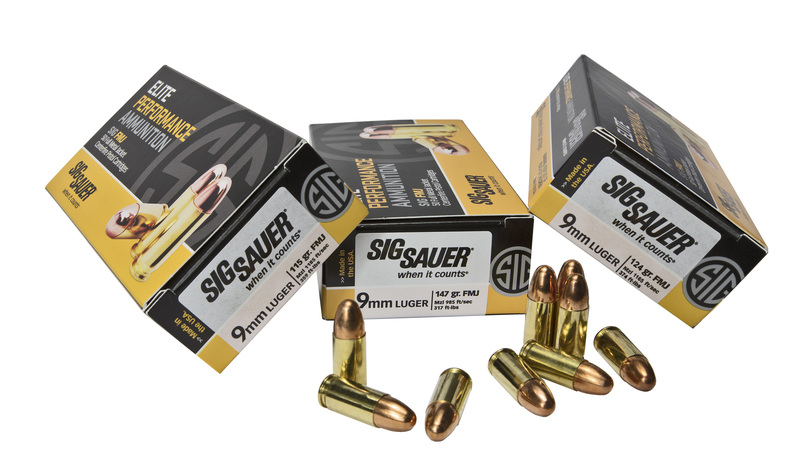 Manufactured to meet or exceed SAAMI specifications, the SIG FMJ centerfire pistol cartridges feature solid brass cases and durable copper jacketed bullets that stay with the lead at impact. Dependable primers and clean-burning powders are used for reduced barrel fouling and more reliable functioning. All SIG SAUER Elite Performance Ammunition is manufactured by SIG SAUER at its new ammunition manufacturing facility in Jacksonville, Arkansas to the same exacting standards as the company’s premium pistols and rifles. For more information, visit www.sigsauer.com/ammunition.